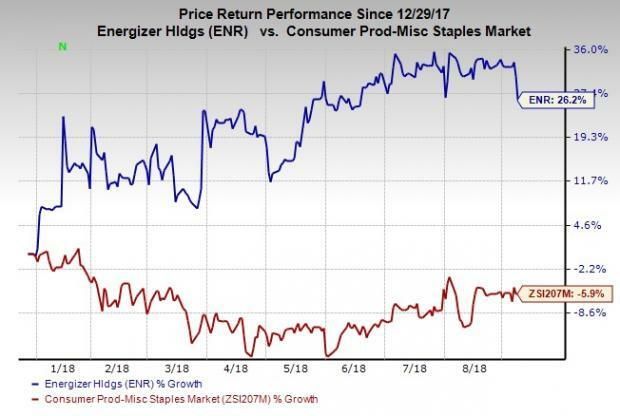 Energizer Holdings, Inc. ENR, which is about to acquire Spectrum Brands’ SPB Global Battery and Lighting Business in a $2-million deal, has rallied 26.2% year to date against the industry’s decline of 6%. In fact, the addition of the latter’s Rayovac and VARTA is in sync with Energizer’s portfolio and Eveready brands. The transaction is expected to close by this fiscal year. With this deal, the company will be able to increase its presence internationally and widen its manufacturing capabilities. In this regard, the company remains optimistic to achieve synergy benefits of $80-$100 million in the first three years of ownership. Also, this deal will boost the company’s top line and strengthen its cash flow, thereby providing long-term value to shareholders. Prior to this, Energizer acquired Reed-Union Corporation’s automotive appearance business including the Nu Finish Car Polish and Nu Finish Scratch Doctor brands. The strength of these brands along with the company’s existing Lexol and Eagle One products is likely to aid the company build its auto care business. In addition to this, product innovation is another major growth driver for this Zacks Rank #3 (Hold) company. As part of its efforts to enhance innovation pipeline, the company is investing heavily to improve product performance and customer experience. For this, the company has implemented portfolio optimization focused on simplifying the category and making the world’s longest lasting AA batteries, Energizer Ultimate Lithium, more visible and accessible to consumers, which benefited results in the fiscal third quarter. Nevertheless, the company is reeling from strained margins for the last few quarters owing to price volatility in raw materials, especially steel. Though the company anticipates the impact of these tariffs to be minimal in fiscal 2018, it estimates a negative impact of 50 basis points on gross margin in fiscal 2019, excluding any pricing actions. Overall, the current tariff situation remains highly unpredictable, and any adverse outcome may weigh on the company’s results. Also, increased debt level along with high interest expenses remains a concern. All said, we believe that the above-mentioned efforts undertaken by the company will not only help drive top-line growth but also combat these hurdles. Ollie’s Bargain Outlet Holdings, Inc. OLLI has a long-term earnings growth rate of 12% and a Zacks Rank #2 (Buy). You can see the complete list of today’s Zacks #1 Rank (Strong Buy) stocks here. WD-40 Company WDFC has an average positive surprise of 8.2% in the trailing four quarters and a Zacks Rank #2.